in a bowl on the floor. Last week one of our cats got lost in the house. Seriously. She was gone for almost 72 hours and we were sure that she had gotten out and was gone for good. We found her stuck in a closet that must have some kind of secret passage way in and out, because it’s just a few feet from Katelyn’s bed and the cat had meowed so much over the 3 days that she lost her voice for a while. After that ordeal, she was a little dopey, wandering around aimlessly and sleeping in very unusual spots. She also started eating the dog’s food. Their bowls have been side-by-side for almost 5 years, and she’s never even sniffed at it until this recent episode. Today, the dog got even. He emptied her bowl. This post likely will appeal to maybe 0.1% of the very few readers I haven’t yet driven off. So be it. In the last couple of weeks I’ve started wet shaving (or “wetshaving” as some would have it). 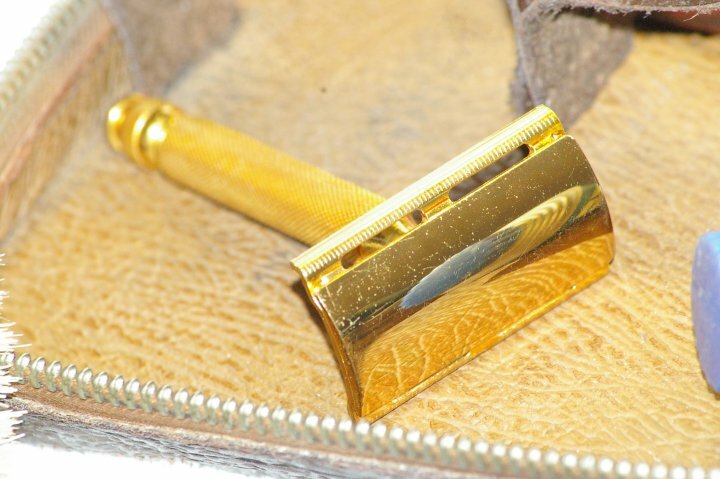 I bought a Burma-Shave shaving brush, some soap, a pristine late 1940s Gillette Tech — 24k gold plated (about $10 including shipping on eBay), and some Personna double edge blades ($0.20 ea). The combination makes for a very nice close shave. I’m enjoying the ritual of it. Lathering up the soap in a mug is an art in and of itself (an art that I’m not close to mastering). The whole process takes maybe 10 minutes total or about 5 minutes more than the new-fangled foam in a can and cartridge blades. It’s possibly the best 10 minutes of the day.